Railpictures.ca - Glenn Cherry Photo: RLK 3873 is the selected power this day for SOR’s short lived daily switching service to customers Hagersville north along the line to and including Caledonia. SOR 595X is just returning to Hagersville from a light run to Caledonia on a clear, sunny winter’s afternoon. These week-day treks provided a most enjoyable day light chase providing many differing photo opportunities. 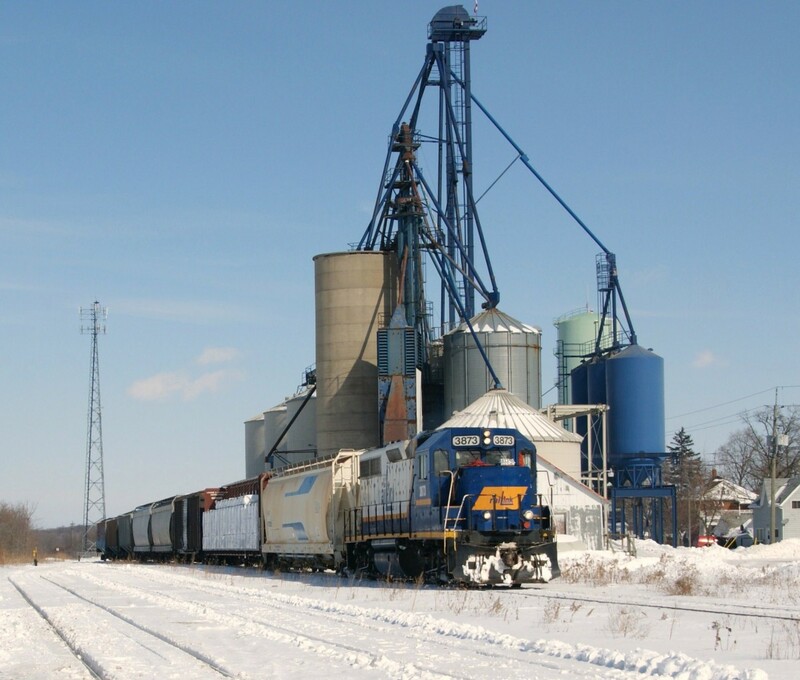 RLK 3873 in clean livery is seen easing upgrade past the former Hagersville Elevators combining for a nice local winter scene. I would like to enter this photo into the “Time Machine” challenge to be partnered with the 1986 photo, of the CP powered steel train (6 month) at the exact same location, submitted by John Eull. Note the addition of the lattice tower, Haldimand-Norfolk water tower (white) and 3 in-a-row blue load-out bins. The white office depot peaking around from behind the lead power in each photo is no longer part of the facility due to a suspicious fire. John’s companion photo is http://www.railpictures.ca/?attachment_id=4863 | Railpictures.ca – Canadian Railway Photography – photographie ferroviaire Canadienne. Copyright Notice: This image ©Glenn Cherry all rights reserved. Very nice. Not easy to catch action along this line.